I just added firstdate and firstwastetype as sensors (release 2.0.6). Cheers. Vandaag is het **<font color=green>[[ sensor.vandaag.state ]]</font>**. Please allow for one more suggestion, Ill illustrate with the below screenshot. AS you can see we have the 4 sensors for trash, and the trash_today/tomorrow. It today/tomorrow are Geen the next pickups for each trash type are shown. But, and that’s my point, when trash_today has a trash_type (and your new trash_firstdate = Today, the same 4 trash_types are displayed. Put in another way, Today is still among those 4.
btw, your new sensors are behaving very nicely! thanks again for adding those. From a UI perspective I could maybe understand this, but I would really like to the behaviour to stay as-is. Otherwise in any of my trash-type specific automations I would always have to check the specific sensor, but also if the ‘today’ and/or ‘tomorrow’ sensor are of the desired type. any of my trash-type specific automations I would always have to check the specific sensor, but also if the ‘today’ and/or ‘tomorrow’ sensor are of the desired type. not sure what you’re saying here? what would be your problem? glad to help if needed. can’t see what trouble my suggestion would cause for any automation? As an illustration, what automation would use the date of sensor gft, when you also have trash_today? well, I think you shouldn’t worry, because my suggestion doesn’t touch the todays / tomorrows sensors. to be 100% certain please post one of these automations ? my suggestion was merely to have the trash_type sensor that is currently showing today’s date as the next pickup date, flip to the next date for that trash_type. No use having it show the whole day, what was picked up today isn’t there? having 2 automations, (1 notification for tomorrow, 1 for today) suffices, or do you have more? But I understand what your point is. 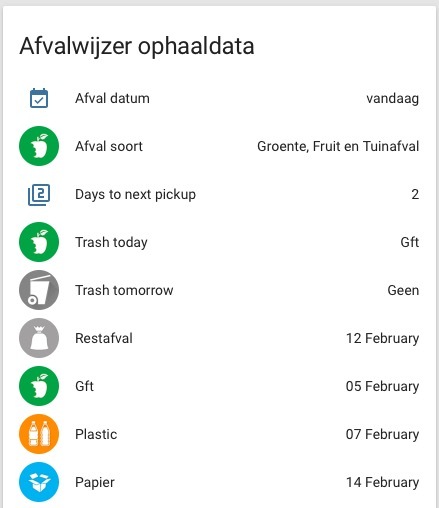 As for for the sugestion, I think you mean that if the sensor today shows trash types for today, then the trash type sensor should show the next pickup date instead of the today date/value? I think you mean that if the sensor today shows trash types for today, then the trash type sensor should show the next pickup date instead of the today date/value? yes please. that would be very nice. would there also be a way to have a sensor.trash_day_after_tomorrow? 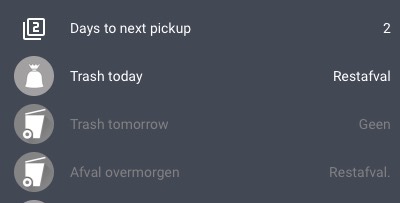 I ask because the website shows these ‘overmorgen’ pickups. 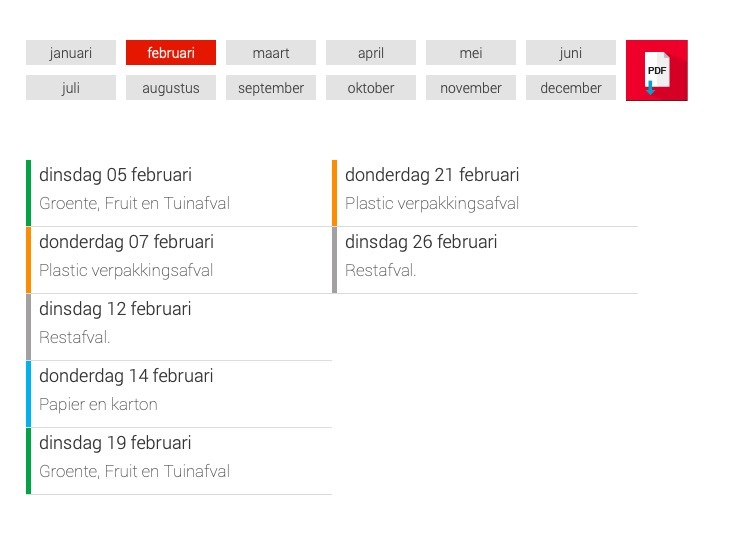 in our municipality, there’s always pickup in pairs per week, and on the first day of that pickup, ‘overmorgen’ is available too. Don’t think it is a template made on the trash_next, like my handmade below but a true scrape for ‘overmorgen’. This is great dude! I was planning to create this myself, but then I saw your component, awesome! I hadn’t seen that yet, but it looks pretty nice. I think I’ll change my current (to-do list based) automation for this notification based setup. the seems to have killed the trash_today, which doesn’t show correctly anymore, while sensor.trash_firstdate == ‘vandaag’. changed it back to if value_date >= today_date: makes it popup immediately again, but unfortunately also give me back the reason I asked… Now how can we have the dates shift, and still have a valid sensor.trash_today? Or just use glance card? I make it optional so you can choose. I`m on a holiday at the moment, but when I return I’ll draft a new release. cool, have a good holiday ! make it a good one. maybe we have to combine things, like on a pickup day, compare the dates for day after tomorrow… still, I have hope you can find a way to find ‘overmorgen’ on the afvalwijzer.nl page and scare that somehow. Yesterday i installed everyting and it was working well. Since today it’s showing ‘Geen’ and i think it’s getting no data. The website afvalwijzer is working. More people with this problem? Was doing the install just now, running in to the same issue. Having the same problem now as well, worked flawlessly before, so I guess something changed on the mijnafvalwijzer.nl website. Update: the output has changed from mijnafvalwijzer.nl. The output now contains a lot of spaces. As a workaround I`m stripping all spaces from the output so this error won’t occur again.